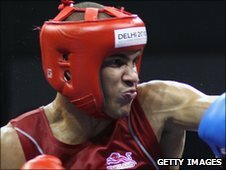 Lowestoft's Anthony Ogogo says a series of tough fights cost him in his middleweight gold-medal bout with Northern Ireland's Eamonn O'Kane. The 21-year-old overcame Youth Olympic winner Damien Hooper and world number one Vijender Singh before being outdone 16-4 by O'Kane to take silver. He told BBC Sport: "I don't want to take anything away from my opponent but I felt tired in there. "I've had four hard fights, I was by far on the hard side of the draw." He added: "I haven't got to repeat who I beat to get here, but obviously some top kids. "I think he'll [O'Kane] even admit he had an easier passageway here." The Suffolk fighter has vowed to bounce back from the disappointment, insisting he will aspire to become 'unbeatable' in the future. "I want to be an Olympic champion, I've still got two years to go, I'm only 21, I'm still quite a physically immature 21-year-old," he said. "No disrespect to O'Kane but in two years time at the Olympics I'll be beating people like that, quite comfortably as well. "I'm halfway through the learning curve at the minute, in two years time I hope I can be near unbeatable."